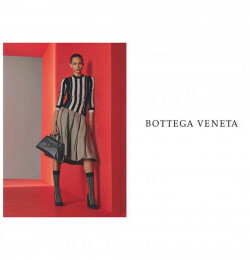 Founded in the early 1960's, Bottega Veneta is a manufacturer of consumer goods, producing primarily men's and women's ready-to-wear clothing, small leather goods, and exclusive home items. 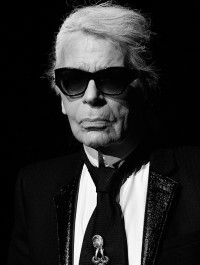 The company is reputed for quality and exclusivity and its famed signature Intrecciato Line. It's headquarters is in Milan, and they have a showroom in New York. The company merged with Gucci Group in July 2001. Bottega Veneta was launched by Vittorio, who run the company, and Laura Moltedo, who was Bottega’s creative director and president for many years, in 1966. It developed as a family business of luxury leather accessories in Vicenza, near Venice. 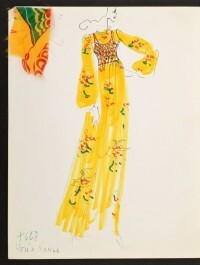 Today it designs both men's and women's ready-to-wear line. Bottega is seen as a timeless signature brand by many. It is also known for not putting its label or any logos on goods. 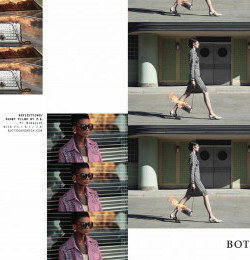 Bottega Veneta brand boasts distinctive styling, yet is only labeled on the inside. Bottega Veneta’s approach is best summed up by a company slogan that loosely translates as "When your own initials are enough". Their trademark handbag was made of woven leather strips and it is still one of their highest selling bags. They have updated it with soft suede and plenty of fringing. BV uses highest quality materials, unique craftwork and innovative design. In 1998 they made an addition to their leather accessories lines, they moved into women’s ready-to-wear garments. These have been very successful. Gucci acquired the company in 2001 and Tom Ford is personally getting the company moving faster. Ladies who know fashion and who buy to archive, including Nicole Kidman, Scarlett Johansson, and Sarah Jessica Parker.